I'm working on a brochure this afternoon and wanted something nice to drink with it. Is it iced coffee weather? I was told no. Bummer. So I put up this desktop wallpaper instead, and now I'm going to make myself a hot latte. Heck, it's 90 degrees in NJ. It's totally iced coffee weather. So, just pretend you're here. *happy belated birthday, by the way! Thanks, Michelle! It's 38 and cloudy here. I'm so jealous. Everyday's coffee weather here in Seattle, whether it's iced or hot, sunny or pouring rain, so go for it! It's 65 degrees in Nor Cal right now and it STILL gave me a big fat No. I've got to say though, I'd rather have a hot beverage in my 65 degree weather than in your 38 degrees. I'm a rebel and drink iced coffee year round! Well, that's just plain craziness. It's ALWAYS coffee weather for me, be it iced, hot, latte, cap. Doesn't matter. Caffeine is good. And so is that wallpaper. Yay! It's iced coffee weather here. Although I think it's a bit chilly. It is iced coffee weather, here! ice coffee weather here, have been enjoying it a bit too much! nice wp. Iced coffee/Frappucino weather here in Phoenix. Love the background. Surprised it doesn't have an orange straw. It snowed a little bit, but I'd still go for the iced coffee over the warm one! Gotta think spring! So funny...this is my background as well. I grabbed it from the amazing site you recommended. My students love to see what I am going to put up. For being from Minnesota, Jess, yer a wimp. :P I drink three giant iced macchiatos @ B&N every Saturday starting when the mercury hits 45 or so. I drink iced coffee any time of the year! I LOVE hot coffee but iced coffee is a favorite of mine and I can't help but drink it all the time! I guess 98.6 does qualify as iced coffee weather. It's only 41 in MN right now. But I have a home-made frappachino in my hand. And made with leftover cold coffee, local cream, sugar free hershey's syrup and splenda, so it's not even that naughty. Mmmmmm. I say go for it regardless of what the website tells you. didn't you post a homemade iced coffee recipe here once? don't let some pierced barista boss you around. Awesome illustration. I assume you did it? Very cool. I do graphic design, but, ironically, can't draw worth beans. Except cute stick figures. Love you site. No, no, I didn't do it; just fetched the wallpaper from one of my favorite desktops sites. I've updated the post with an image credit, which I forgot! Thanks. Any weather is iced coffee weather! It was warm down here, but today I had to wear a long-sleeved shirt ... weather's weird. Hot coffee, iced coffee, even luke warm bottom of the pot coffee, anyway you fix it you just can't go wrong when you've got to buckle down and work on a new project. Definately Iced Coffee weather in Santa Barbara although my new favorite drink is Zevia (the no-cal soda sweetened with Stevia). Isn't it ALWAYS iced coffee weather??? OR, you know it is always 5 o'clock somewhere...well, its always 70+ degrees somewhere, too. This is so cute! But I'm afraid it'll make me crave Starbucks even more than I do now! That's so cute! And actually, my nephew, Tom, is Simple Desktops! Cool! 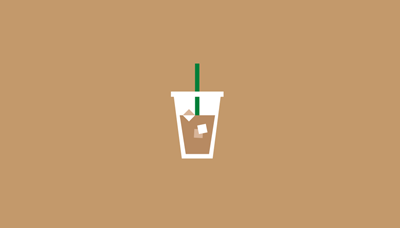 It's totes iced coffee weather here - especially since the AC in my apt and car went out! waaaaah! In my oppinion, it's always a good day for iced coffee... regardless of the weather! Did you make that wallpaper? I'm very inspired by the minimalism of it. Nope, it's by Jess Neil.